You know what’s even better than cupcakes? A cupcake with a hidden surprise inside! These Chocolate Peanut Butter Cupcakes look like your standard chocolate cupcakes. Rich milk chocolate topped with a peanut butter chocolate frosting. However, as unassuming as they appear, they hold a secret. Nestled inside the chocolate is a spoonful of creamy smooth peanut butter. This is one surprise I don’t mind at all finding in my dessert. 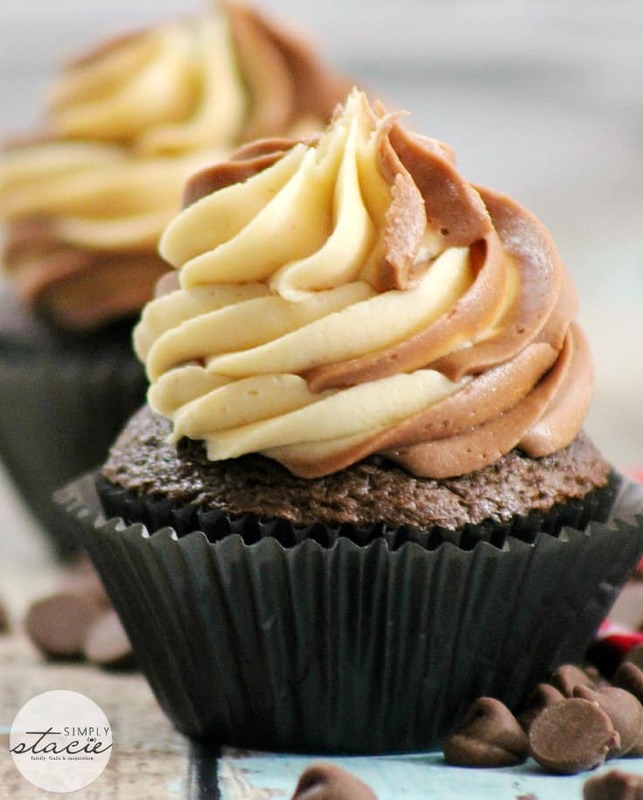 Whether you’re making cupcakes to celebrate a special occasion or just because, these luscious chocolate peanut butter cupcakes will satisfy your sweet tooth. Sometimes I’m just in the mood to bake and cupcakes are often what I make. They are so easy and hard to mess up. Plus, I’m thinking about portion control and tell myself I’ll only have just one. It’s treats like these that test my will power. I’m watching my waist line, but will indulge with a small treat once in awhile. Who can resist the chocolate and peanut butter combination? Not I. Would you eat the frosting first or would you take a bite to get a little of everything in there? 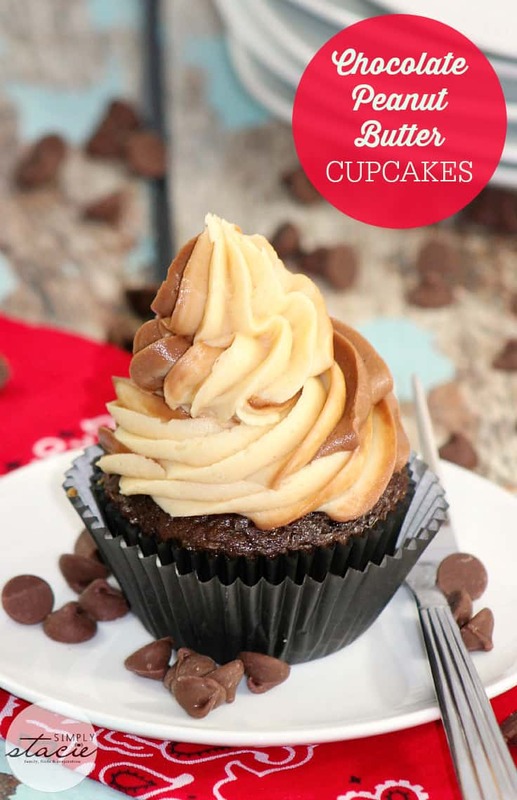 Luscious recipe for Chocolate Peanut Butter Cupcakes piled high with frosting! In a large bowl, cream together sugar with butter until light and creamy. Add in eggs, one at a time, mixing after adding each egg. Add vanilla. In another bowl, sift flour, cocoa, baking soda, baking powder and salt. In small batches, add dry mixture to wet mixture, alternating with milk. Make sure to start and end with the flour mixture. Beat until well combined. Scoop batter into the prepared cupcake tin, about 3/4 full. Bake for 20 to 25 minutes, or until a toothpick comes clean from the middle of a cupcake. Cool for 10 to 15 minutes. Scoop out center of each cupcake with a spoon or cupcake scooper. Spoon in peanut butter until it reaches the top of the cupcake. In a large bowl, cream the butter with an electric mixer. Add in the powdered sugar. Slowly add the whipping cream and continue to mix until the frosting can hold a stiff peak (may take several minutes). If it’s not holding a stiff peak after several minutes, add in more powdered sugar, if need be. Evenly divide the frosting into two bowls, In the first bowl add the cocoa powder and mix well. In the second bowl, add the peanut butter and mix well. Scoop the chocolate frosting into a pastry bag with a large frosting tip. Mash the frosting with the back of a spoon while its in the pastry bag. Turn the pastry bag. Scoop the peanut butter frosting into the same pastry bag. Mash the peanut butter frosting with the back of a spoon in the pantry bag. Twist the open end of the pastry bag until the frosting begins to come out. Frost the cupcakes. OMG I totally need these for my dad’s birthday party. I love peanut butter! mmmm these look so yummy & I love peanut butter in any way shape or form!! I’ve got to try these thank you so much. Wow this is one special cup cake. I wish I had one. I love chocolate and peanut butter combinations (Reese’s are my fav candy). Chocolate and peanut butter — unbeatable combo! I usually eat the frosting and the cake together, I think that’s the way it’s meant to be eaten. I can’t wait to give this a try, you know I love chocolate. Thank you for sharing this recipe. Oh wow these look so good and pretty, my daughter makes a mean peanut butter and chocolate cupcake but they don’t look this good, shhhh don’t tell her…lol!!! These would go over great in this house and disappear very quickly! Look so good! The kids would absolutely love them! hanks for the recipe! 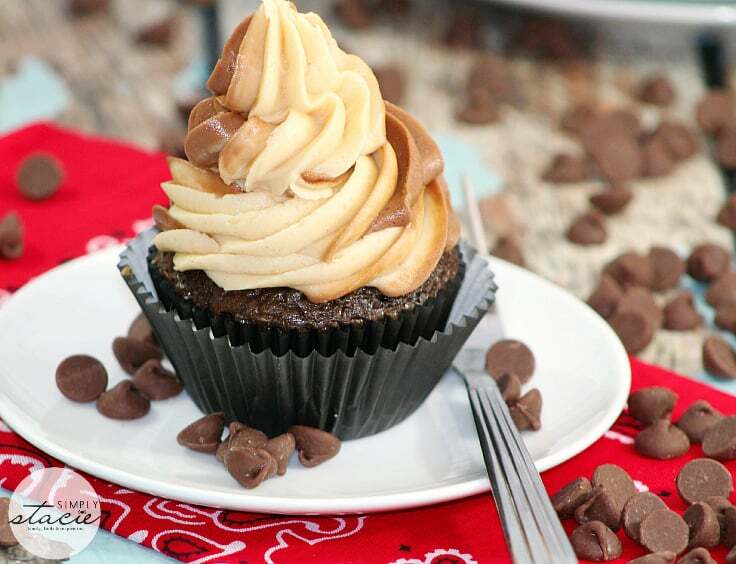 This recipe for Chocolate Peanut Butter Cupcakes is one of the most delicious and decadent that I have read in a while. I know they are wonderfully rich and scrumptious so, at some point, I will have to make them. These look so yummy! I would love to give these a try! Thanks for sharing! These sound absolutely delectable! I wish I had some right now! Yum! And peanut butter in the center?? Sounds delish! Hi there! Visiting from the Lou Lou Girls’ link party. These look so yummy! I love chocolate and peanut butter together! Thank you so much for stopping by Wonderful Wed. blog hop and linking up. Your chocolate peanut butter cupcakes look amazing. Pinned! Peanut butter and chocolate is such a great combo!! That frosting looks so soft and creamy 😀 Thank you for sharing with us at Friday Favorites, we loving having you join us! The cupcakes look so good. I am going to make some for my grand kids next time they are over. Mmmm cupcakes. That looks heavenly. 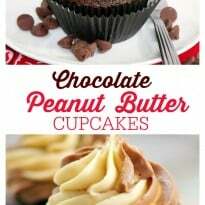 Chocolate and Peanut butter has always been a winning combination and these cupcakes sound delicious. I will save the recipe and thank you for sharing with us.